Workers’ Rights, Women’s Issues, Global Commerce, and Economic Impact On Community. 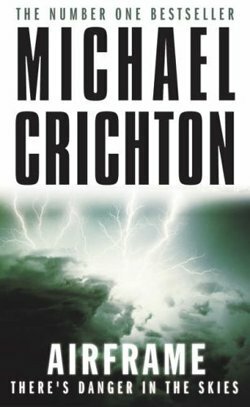 Besides being a nonstop suspense mystery, Michael Crichton’s AIRFRAMEis a well-reasoned plea for government oversight and safety regulation of today’s passenger airline industry.This 448-page fiction novel begins with an inflight emergency aboard a Hong Kong passenger jet bound for LA. After severe turbulence, the pilot has been decapitated, several passengers are seriously injured, and no one knows why. The plane’s manufacturer “Norton Aircraft” assigns quality control officer Casey Singleton (an experienced, 12-year veteran of Norton) to lead the investigation. Singleton (a recently divorced mother, trying to provide for her 10-year-old daughter) is also training her new “assistant”. With motivations of his own, Bob Richman is a young, newly hired executive with no industry background whatsoever. Fresh out of college, with “an unmistakable sense of entitlement” – Bob is a relative in the Norton family tree working his way up through the corporate divisions. In all likelihood, Casey Singleton realizes she soon will be working for Bob Richman. Not for the first time, we begin to see AIRFRAME’s layers of social implications. Bob’s mind is elsewhere as Casey shows him the ropes, but we readers reap the rewards of every knowledgeable word. In his usual fashion, Michael Crichton takes us on a roller-coaster ride through every conceivable nuance, corner & nook of the airline industry. Indeed AIRFRAME is edutainment at its best. In the air traffic control tower, we listen in on the radio chatter with the Hong Kong airline. We watch as a pilot qualifies in Norton’s flight simulator. While Bob Richman complains, we learn why coffee isn’t allowed anywhere near aircraft assembly (o! the horror!) From design to production; from periodic maintenance to in-house politics. From bolts with individual serial numbers to reporters whose ratings outweigh their journalistic integrity. AIRFRAME throws us into a bewildering hurricane of conflicting alliances, planned obsolescence, and cascades of events. In this crazy and unstable environment, Crichton makes an eloquent argument in favor of Regulation of aircraft safety and maintenance procedures. I can’t say enough about this GREAT BOOK! I learned more from AIRFRAME than I did in 4 years on a B-52 flightline. For more info, check out http://www.michaelcrichton.net/books-airframe-history.html.